Anuriel is a Bosmer and the steward to Jarl Laila Law-Giver of Riften. She is usually found at the Jarl's side in Mistveil Keep and will sleep from midnight to 8am in her bedroom just beyond the doorway to the inner part of the Keep. She is the girlfriend of Unmid Snow-Shod, and you can overhear a conversation between the two about sneaking out for a "training" session. 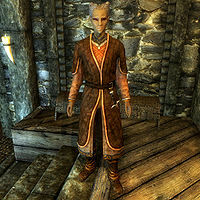 Should the Imperial Legion take control of Riften and have Jarl Laila replaced, Anuriel will be exiled to the Palace of the Kings. Once the Jarl grants you permission, Anuriel can sell you a house called Honeyside in the city for 8,000 gold. In order to get permission you must complete the quest Supply and Demand. If you side with the Imperial Legion in the civil war, you will be sent by Legate Rikke to find material you could use to attempt to blackmail her to obtain information that could assist in the Imperial takeover of the Rift. In the process, it is discovered that Anuriel is actually a Thieves Guild infiltrator put in place by Maven Black-Briar to manipulate Jarl Laila into defending Maven's interests and keep her blind to the activity of the Thieves Guild. Anuriel wears a set of fine clothes and a pair of fine boots. She is equipped with a leveled dagger which can be up to elven quality, and carries a selection of upper-class loot and gold. Unmid: "Anuriel, would you please stop declaring that the city is safe for the Jarl to roam? You and I both know that isn't true." Anuriel: "I would never knowingly place Laila in danger, you know that too. Why do you always question my judgment? You don't trust me." Unmid: "I trust you, I'm just concerned about her safety. That's all. Don't be angry with me." Anuriel: "I'm not angry with you. Tell you what, lover. Meet me in my chambers later and we can discuss the situation in private." Anuriel: "Unmid, my sweet. Are we still meeting later for... combat training?" Unmid: "Of course. Your training isn't complete yet." Anuriel: "I look forward to it then." Laila: "Excellent, then they'll [sic] be no need to devote any resources to stopping it. Thank you, Anuriel. That will be all." Anuriel is a member of the monk class, which determines the level of her skills. Anuriel was supposed to tell you about the Black-Briar family when asked; however, the conditions for the topic will never be met, so her praise will never be heard: "Maven Black-Briar is the owner of the largest and most profitable business in all Skyrim, the Black-Briar Meadery. We're pleased to have her in Riften. She brings stability, opportunities for employment and strategic value to our city." This page was last modified on 9 December 2017, at 17:28.